Rega Planar 8/Apheta 2 review | What Hi-Fi? The Rega Planar 8 is something of a departure. Normally, Rega believes in evolution rather than revolution. Anyone who’s followed the company’s history will recognise the pattern of a product being launched and then carefully honed over the following years. It’s a path that’s been followed successfully by the likes of the Planar 1, 2, 3 and 6, as well as the industry standard RB300 tonearm and its derivatives. Many of these products have been around for decades and still remain on top of their respective classes. This suggests that such a measured approach works. The Rega Planar 8 takes a different approach. Rather than being a gentle evolution of the previous (and still rather good RP8) this new turntable takes its inspiration from Rega’s Naiad. Never heard of the Naiad? Neither had we until recently. It’s something the company considers the ultimate representation of its engineering ideas when executed with little regard for cost or ease of manufacture. In other words, the best deck Rega knows how to make. Don’t look for it on the website though. It’s in limited production, likely to be capped at around 50 units. It costs a cool £29,999, but you also get a titanium tonearm and a host of Rega accessories. This new Planar 8 is designed to encapsulate the essence of the Naiad at a far more affordable price. Just look at it. This skeletal deck is like little else out there. The older RP8 has something of a similar flavour when its rectangular plinth frame was removed, but this new one looks even more extreme with its angular shape and aggressive cutouts. The idea is to minimise plinth mass while increasing rigidity. The plinth is has an ultra lightweight Tancast 8 polyurethane foam core sandwiched between two layers of HPL (High Pressure Laminate). This new plinth is 30 per cent lighter than that used on the last model and more rigid with it. Rega believes that mass absorbs energy and that ends up taking the life out of the music. The company thinks that rigidity is most needed between the tonearm mounting and main bearing, so it adds a phenolic brace between the two – a clever way of adding reinforcement without significantly increasing overall mass. In contrast to the cheaper models in the range there isn’t much carry-over of parts. The Planar 8 has a new main bearing assembly, which uses a single-piece aluminium sub-platter and hardened tool steel spindle running inside a custom brass housing. Much care has been taken with the way this bearing mounts onto the chassis, so that the transfer of unwanted energy is minimised. The platter is something of a work of art. It’s made of three pieces, with two different types of laminated glass. While Rega goes to extreme lengths to avoid mass, this is one area where more mass leads to better results by creating more of a flywheel effect to smooth out any small speed fluctuations. The company’s solution adds mass at the platter rim, rather than make the whole thing heavier. Keeping the platter as light as possible also makes the main bearing’s job easier. Rega’s well-proven 24v motor provides the drive to the platter. It’s powered by the Neo outboard power supply, which is hand-adjusted to match the motor optimally. The company even goes as far as developing its own drive belts to ensure consistency and therefore improve speed accuracy. There’s also a new tonearm. The RB880 may look like the designs used on Rega’s cheaper turntables but it has an improved vertical bearing assembly and impressively high standards when it comes to free-play. The bearing assemblies are adjusted to an impressive play of less than a 1000th of a millimetre. The arm uses low capacitance phono cables terminated by some high quality, lockable plugs to ensure a good contact. The Planar 8 is available in four guises. You can buy the deck without cartridge for £1699, but it can be equipped with the Exact moving magnet (+£210), Ania moving coil (£420) or with the Apheta 2 MC (+£740) we have on test here. The Apheta 2 (priced at £1049 if bought separately) is the latest and extensively refined version of the company’s original range-topping moving coil. While not particularly high output, it works without issue into our reference Cyrus Phono Signature/PSX-R2 phono stage. 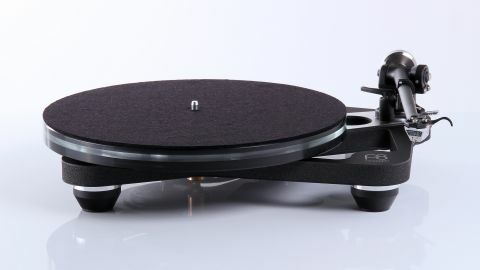 The Planar 8, as with other Rega turntables, doesn’t have much in the way of suspension. There are just three soft feet to absorb external vibrations. You’ll need a level and rigid support, positioned as far away as possible from your speakers to get the best from it. Rega makes a custom wall bracket for just this job. Set-up is easy. The cartridge is pre-mounted and its alignment is guaranteed thanks to the brand’s unusual three-point mounting system. All the user has to do is remove the packaging protecting the main bearing and arm, fit the tracking weight and set bias. The Apheta 2 tracks nicely at around 1.9g. Once up and running, the Planar 8 puts clear air between itself and the cheaper decks in Rega’s catalogue. It delivers a level of clarity and insight more reminiscent of far pricier high-end turntables than anything its talented siblings can manage. We start with Orff’s Carmina Burana and love the way this package copes with the music’s wild dynamics and changing momentum. The presentation is as insightful as we’ve heard at this level, and all that detail is organised with class-leading levels of composure. The Planar 8 always sounds in control no matter how complex the music gets. Yet, all that control doesn’t dilute the drive and excitement of the recording, as it can do with some rivals. This package is tonally well balanced. It’s smooth when required but still has enough bite when the music demands. In absolute terms it’s possible to get more in the way of sonic authority and weight – the Planar 8 has a strikingly taut and agile presentation – but you’d have to spend thousands extra to get it while matching the Rega’s strengths. We’re pleased with the stable and focused stereo imaging. The record player renders an expansive soundstage and locks instruments in place even when the production becomes dense. Image scale is good for the price – the sound extending well beyond the edges of our reference ATC SCM 50 speakers. We switch to Bruce Springsteen’s Born To Run and the Planar responds with a combination of attack, drive and rhythmic precision that we haven’t heard bettered at this price. While delivering each musical strand with clarity, it manages to tie everything together to produce a cohesive and massively enjoyable whole. It’s this combination of hi-fi analysis and simply communicating the emotion in the music that the Rega does so well. We listen to a range of records while testing this player from the gritty reggae of Bob Marley’s Concrete Jungle all the way through to the heartfelt gospel-tinged blues of Eric Bibb and Needed Time’s Good Stuff, and the Planar 8 always sounds at home. It has a wonderfully articulate way with bass that combines punch, power and texture beautifully. The lows don’t dominate, but they do give a solid foundation for the rest of the frequency range to shine. An articulate midrange ensures that Marley’s distinctive vocals come through with the passion they deserve, while the crisp but refined highs render the rich harmonics of Eric Bibb’s acoustic guitar convincingly. We’ve long felt every step up the Rega turntable ladder brings with it worthwhile sonic gains but they’ve tended to be incremental. But the performance gap between the Award-winning Planar 6 and this new Planar 8 is huge. In being so ambitious with this record player’s engineering, Rega has pushed the boundaries of performance at this level and has given premium rivals positioned above it plenty to worry about. Highly recommended.